A powerful sequencer capable of interesting results, that is somewhat hampered by its high cost and single-colour LED interface. Brings analogue-style step sequencing to MIDI gear. A great way to programme complex drum tracks in a hands-on fashion. More flexibility than most DAWs for poly-rhythmic or multimeter sequences. Single-colour LED backlights make setting of some step parameters tricky. Expensive in the face of computer or tablet-based alternatives. No dedicated track selection or tempo controls. Mode Machines is perhaps best known for x0xb0x, its TB-303 clone. However, its expertise also extends to drum expander modules, control surfaces, microphones, modular gear, processor and sequencers. 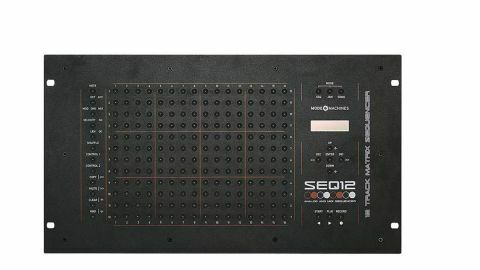 It’s the latter of these that we explore here in the guise of their SEQ12 MIDI Matrix Sequencer. The first thing you notice about the SEQ12 is the plethora of buttons. These dominate the unit, with only the right-hand side of front panel breaking from this, with its LCD display. On the back panel you’ll find three MIDI outs, one MIDI in, a socket for the external power adapter and a ‘programming port’ for upgrading firmware. Turning the unit on results in a blaze of red light. All switches are backed by red LEDs, with the LCD display following suit in with its bright red backlight. Each track can be set to one of three modes - Mono, Chord or Drum. Mono is straightforward, and in pitch terms offers control over note and octave. Chord mode adds polyphony, whilst Drum mode uses each of the 12 lanes to trigger distinct MIDI notes. Sadly, this last mode doesn’t allow you to set a different MIDI output for each lane, as this would have made for a great multi-unit programming system. Each track can store 16 sequences, with independently configurable length and clock division (from the master clock). Tracks (and other settings) are accessed using the arrow keys below the display. It’s a shame that there are no dedicated track selection buttons or tempo controls, as this would have given better ‘on-the-fly’ use. ‘Jam mode’ however lets you ‘perform’ pre-programmed sequences more effectively, with a single button assigned to the 16 possible sequences available to each track (with Function buttons for muting). Unlike many simpler analogue step sequencers, where you might have one knob/switch per parameter, SEQ12 requires you to switch pages to set or alter most settings for each step. This does allow for much more complex sequencing scenarios, but with only red LEDs to guide you, it can get confusing. We can’t help think how much easier things might have been with multicolour LEDs for each mode, even if it added to the cost. We’d hoped things would improve by dimming the studio lights, but this didn’t help. Given how interesting the SEQ12 could be in a live scenario, this is a real shame. Overall, the SEQ12 is a powerful unit, though it does take some perseverance to get the most out of it. It will perhaps find most interest from those looking to avoid staring at a DAW screen or interested in finding new creative possibilities in their current MIDI setup.